April 18, 2018 - by Admin - 3 Comments. Thomson, owned by France-based Technicolor. +The good news is that Thomson is committed to regaling the Indian consumer with its legendary reliability and friendly approach to technology by tying up with Flipkart as an exclusive partner for online distribution. Thomson has partnered exclusively with Flipkart to sell its range of affordable yet top quality smart TVs in India. 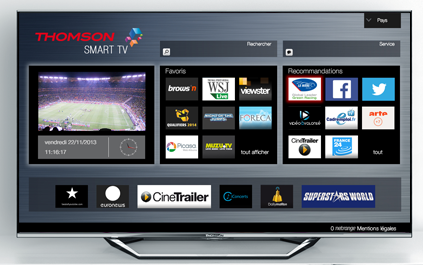 The Thomson Smart TVs comes with default Apps including Gmail, YouTube, Twitter, Facebook as well as Netflix, along with company’s own Aptoide which allows users to download any App. Thomson 32 Smart tv 32M3277, Resolution 1366×768 pixels and 178-degree viewing angle. Android 5.1.1 Lollipop and is powered by a Cortex-A53 processor coupled with a Mali T720MP2 GPU and 1GB of RAM. It consist 8 GB internal storage. Total audio output of 20W.Ports include 1x RF input, 1x AV input, 3x HDMI ports, 1x Component port, 2x USB ports, 1x RJ45 port, 1x SPDIF port, 1x 3.5mm headphone jack, and one SD card slot. It also has Wi-Fi 802.11 b/g/n connectivity. Thomson 40 Inch smart Tv. Model name 40TM4099, Android 5.1.1 Lollipop, and is powered by a Cortex-A53 processor coupled with a Mali T720MP2 GPU and 1GB of RAM. 1x RF input, 1x AV input, 3x HDMI ports, 1x Component port, 2x USB ports, 1x RJ45 port, 1x SPDIF port, 1x 3.5mm headphone jack, and one SD card slot. It also has Wi-Fi 802.11 b/g/n connectivity. It has 8GB of inbuilt storage. It once again features two 10W speakers. Full-HD (1920×1080 pixels) resolution. claims that viewing angle is 178 degree. The 43-inch 4K UHD Thomson television. Model name 43TM4377, It consist 8 GB in built storage. It consist two 10W speakers. Ports include 1x RF input, 1x AV input, 3x HDMI ports, 1x Component port, 2x USB ports, 1x RJ45 port, 1x SPDIF port, 1x 3.5mm headphone jack, and one SD card slot. It also has Wi-Fi 802.11 b/g/n connectivity. It claims that it has 178 degree viewing angle. Android version n in this smart tv is 4.4.4 KitKat, is powered by a 1.4GHz dual-core Cortex-A53 processor coupled with a Mali-T720 GPU, and it consist 1 GB RAM.It sports a LG IPS panel with a 3840×2160 pixels resolution and HDR support.